Goodreads Summary: Amy Goodnight's family is far from normal. She comes from a line of witches, but tries her best to stay far outside the family business. Her summer gig? Ranch-sitting for her aunt with her wacky but beautiful sister. Only the Goodnight Ranch is even less normal than it normally is. Bodies are being discovered, a ghost is on the prowl, and everywhere she turns, the hot neighbor cowboy is in her face. I used to love ghost stories as a child, especially ones that were somehow rooted in truth or legend. 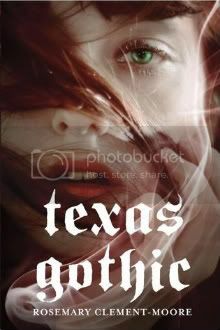 When I saw that this book was a ghost story that added in witches and was set in Texas, I knew I had to read it. And by "had to," I mean that I stayed awake until after 2am one night so that I could finish it. Amy Goodnight would like to be normal, but unfortunately for her, that's impossible. Her family has magic, and she has learned to be careful around their spells and her own tendencies toward witchcraft, even going so far as to be the buffer between the world and her family. When she offers to take care of her aunt's ranch for the summer, she thinks that her ghost hunting days are over. But life has other ideas. Amy suspects that something is amiss when long-buried bodies are discovered on the neighboring ranch. Then there is a ghost who seems to be haunting her. And finally, it seems like someone doesn't want these bodies disturbed. In a small town, gossip flies, suspicions run high, and there's no escaping your family. Can Amy figure out what the ghost wants and help him, all while staying safe? More importantly, can she do it with the devastatingly handsome distraction of her neighbor? This book has everything you could want in a ghost story: mystery and suspense are woven with magic and folklore, and to top everything off, there is a dash of romance. At times it almost seems as though there are two mysteries unfolding at the same time, and the story kept me guessing at the truth until close to the end. The characters really made this novel; in fact, Amy is probably one of my favorite characters that I've read this year. She's not afraid to speak her mind, and what she says is often snarky but usually incredibly amusing. All of the dialogue was great, from the debates between Amy and her sister Phin (think female version of Sheldon from Big Bang Theory, but a witch) and the constant banter between Amy and Ben, the charming (or not, depending on the day) neighbor. I loved the way that the relationship between Ben and Amy grew; the tension and frustration finally led to understanding and attachment. There are also references to other books as well as pop culture that I enjoyed seeing interspersed in here. I also loved the vivid descriptions and the setting of this book. The story truly came to life, and it was that along with the mystery that kept me awake and reading late into the night. Even though this is a stand-alone book, I would still love to see these characters again and know if any other unusual things happened to them. Texas Gothic is a perfect summer ghost story, complete with a refreshing voice and a captivating tale. I will certainly be picking up more of Clement-Moore's books!